The Metalian Parthian belongs in our landscapes. In Mudgee, the judges found it to sail with the grace of a moving shadow and provide for the user with the generosity of a sympathetic caterer. They all agreed that its origins in stringent logic and willingness to be different set it apart as the ideal expedition unit. The Parthian is one solid unit – built strong and tough and with a very South African aesthetic. It’s the mid-size camper in Metalian’s range and is nicely suited to an adventurous couple wanting to explore far and wide. 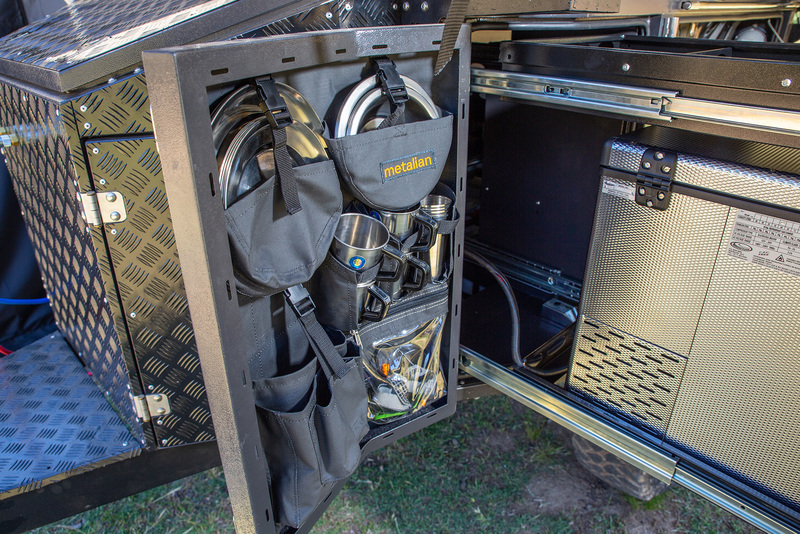 The Parthian is jam-packed full of storage options, and in typical South African style it has a heap of smaller, zippered canvas pockets to maximise your camper’s organisation (if that’s not your thing, they can be removed to allow you to spread your gear in as much disarray as you please). Everything has its place, though – from the crockery dividers inside the door of the kitchen slide, to the demountable camp table that stows away under the roof of the camper box. The kitchen features a two-burner cooktop, 60L dual zone National Luna fridge and a versatile extendable hose that pulls out to reach the plastic tub sink on the end of the fridge slide. The rooftop tent above the camper box lifts on gas struts and has two spreader bars that require adjusting for setup. This tent has a number of appealing features; there’s the large sky window for stargazing from the comfort of your bed, the mesh screen at the head of the bed area that unzips fully so a coffee can be passed up from the kitchen (yes please! ), two USB points conveniently located within arms reach and storage pockets on either side of the mattress. Then there’s the very sturdy access ladder, which pleased the judges to no end. Sturdy is also how I’d describe the 270 degree wrap-around awning that provides plenty of undercover living area. If you’re after extra coverage, you can tack on the additional tent walls and bucket floor, which would provide just enough space for stretchers for a couple of small kids (an optional kids room is also available). The tent wall and floor can stay attached for pack up but the attached ensuite must be removed and packed separately. Returning for another bite at the CTOTY cherry was Metalian, this year with its smaller Parthian camper. 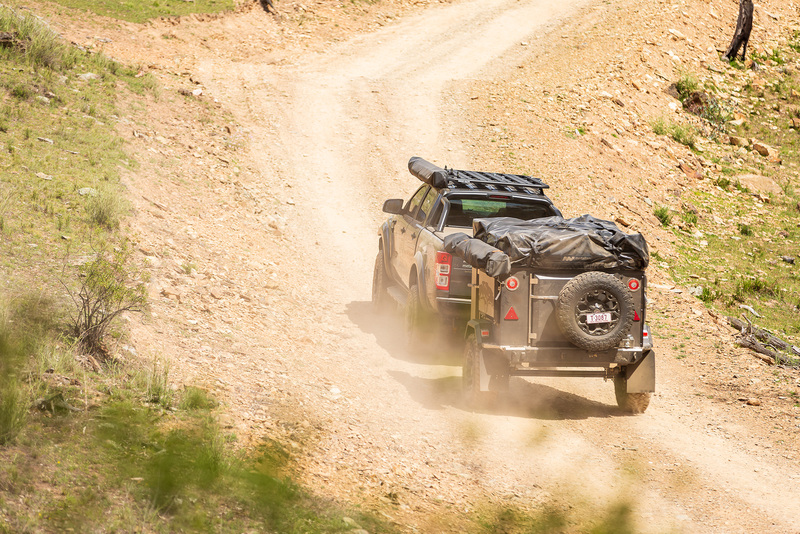 Like last year’s Maxi model, the Parthian is a compact adventure offroader that is at its best in steep and rough country, and – also like the Maxi last year – it was an impressive presentation. The Metalian range is a South African import, with the Parthian curiously named after a race of Middle Eastern warriors from the third century BC. 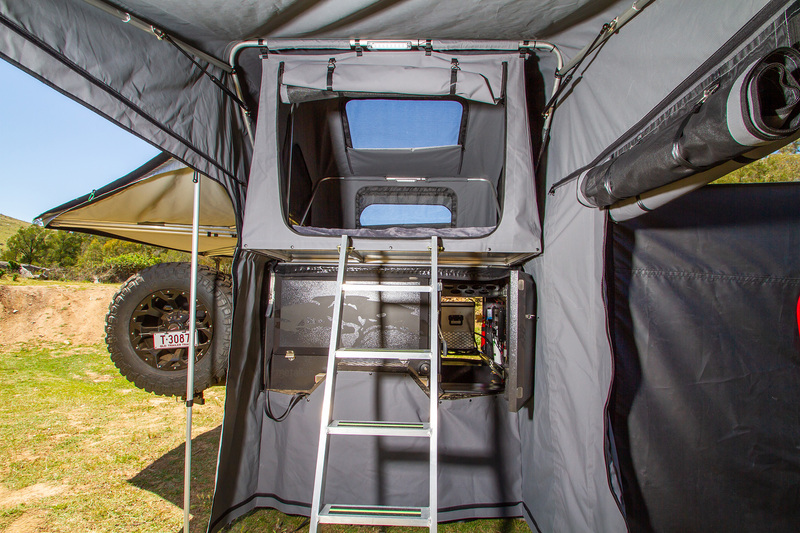 The camper has its share of Australian touches, but displays many features that make those from South Africa immediately identifiable: beam axle, leaf springs, rip-stop canvas, numerous small canvas pockets, National Luna fridge and similar. None of these are necessarily unsuitable – just different. The electrical system is built around a HCdP battery management system (BMS), which includes a 20A DC-DC charger, 20A multi-stage mains charger, solar regulator and an optional 180W inverter. It is lithium compatible if desired, but is probably a bit small in output for the task at hand. The BMS in our case was looking after two 130Ah AGM batteries, ideally mounted down low in the floor, between the two water tanks. The water tanks were 65L poly units, with large, easily-accessed inspection ports. 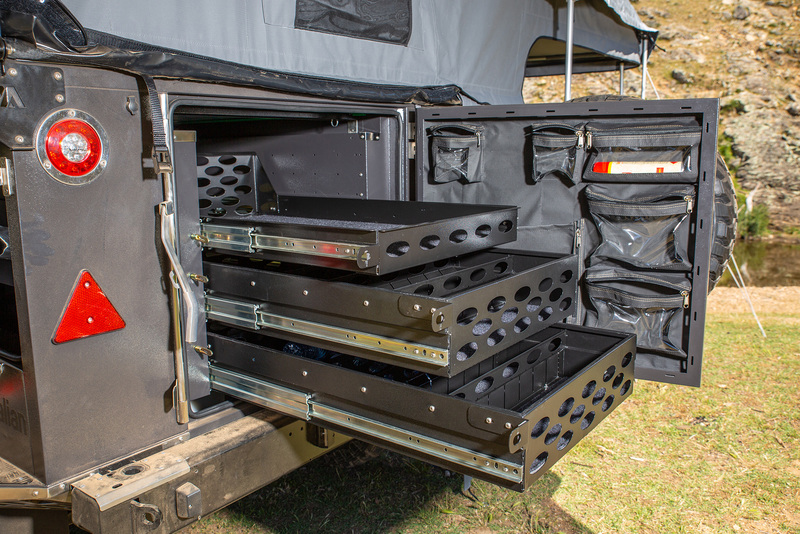 Being internal to the camper, these tanks stay cooler and provide improved aerodynamics compared to external mountings. The system also included a large carbon filter between the tanks and the pump. There were external taps on the front storage box for the ensuite, as well as plumbed hot water for the sink. This was a pull-out mixer design located at the back of the kitchen. Gas came in two 4.5kg bottles in the front storage box where they were handy for connection to the kitchen and the Joolca instant HWS. The Metalian was a capable and well appointed camper with plenty of flexible adaptability. Right from the start this unit shows some innovation we are not used to in this class of imported camper. A compact unit, it is only 3.5 metres long with a Tare of 900kg and a GVM of 1600kg, giving a whopping 700kg payload and 2000 litres of storage. 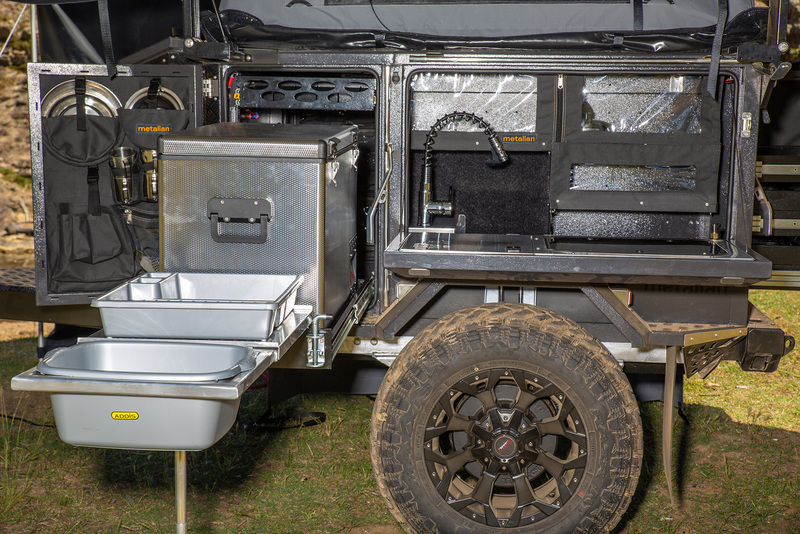 First up, and different from most, there is a complete monocoque base unit made from 3CR12 stainless steel, with a 120x50 C-channel with a welded brace inside, acting as the bearers for the spring hangers on each underside of the camper. 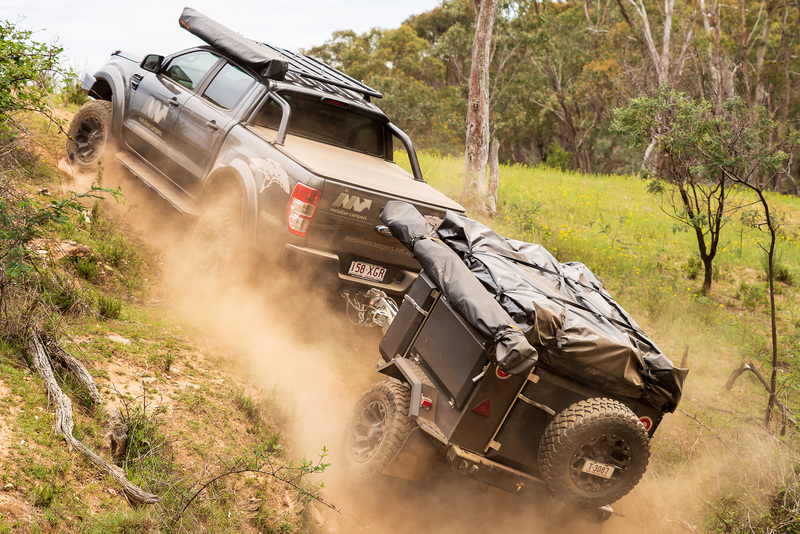 The drawbar is available in three different lengths depending on what vehicle you have and how much clearance you need between the tow vehicle and the front of the camper. Shorter is always better for tough, tight bush work, I reckon. A Cruisemaster DO35 tow hitch with a heavy-duty jockey wheel sits at the front, while the rear bar across the back carries a swing-away tyre carrier and has two recovery points built in. 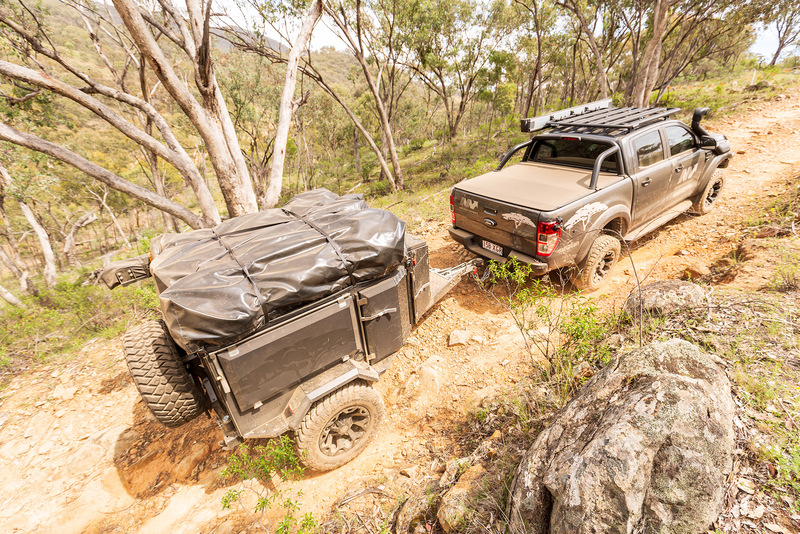 Different to near everything else on the Australian market today, the Parthian has a two tonne AL-KO solid axle. This is a proven, simple and tough setup, and I really don’t see anything wrong with it. 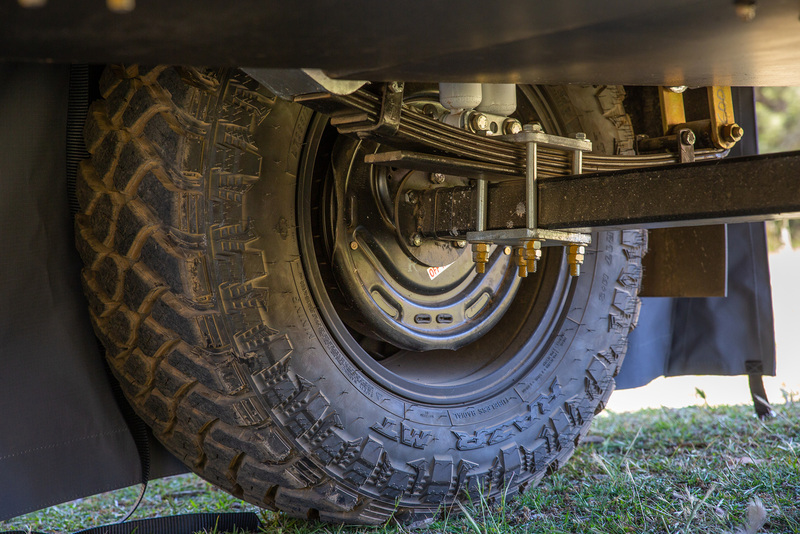 A military wrap five-leaf variable rate leaf spring pack, backed up by vertical (they work better that way) twin Safari offroad shocks, keeps the unit riding well. Stub axles feature parallel bearings and are rated at 2.5 tonne each. Black alloy 17 inch rims fitted with MT tyres and stopped by AL-KO 12 inch electric brakes finish off the suspension and wheel package. There’s polyurethane underbody protection, while the complete trailer is seam sealed at 180°C, with stainless steel bolts with nyloc nuts used throughout. Stainless steel is used in the body and doors, the whole lot being powder-coated in exterior grade epoxy polyester. This is an impressive little camper which has been really well thought out and built – another example of that being the water tanks, which are inside the camper and mounted down on the floor, keeping the weight as low as possible and well-protected. Knowing their weakness, all the canvas work is done here in Oz. Fitted with quality electrical and gas products, I can’t really fault this well-built, tough, go-anywhere camper. I reckon it’s about time we changed the X-Factor classification to WOW-Factor! Either way, the Metalian Parthian grabbed all of our judges with a combined cry of excellence. This is an extremely well-designed and constructed presentation, utilising a great combination of ideas, design, materials and components to make up a premium quality camper that will be a lifelong friend through thick and thin. The Parthian has an excellent weight balance with high wheel clearance and impeccable offroad manners. It is another in the current swing to compact campers, but it constantly amazes just how much they can get into a seemingly small trailer. The manufacturing quality is nothing short of excellent, using a monocoque design and a body made mainly from special 3CR12 stainless steel for strength and longevity. It’s a trailer built from experience, a factor most evident in the attention to detail that you first notice having to open the strong cantilevered locks and three stage dust protection on each and every door. The design is simply amazing and so compact – and yet so spacious. Every component has been closely considered from the ground up. 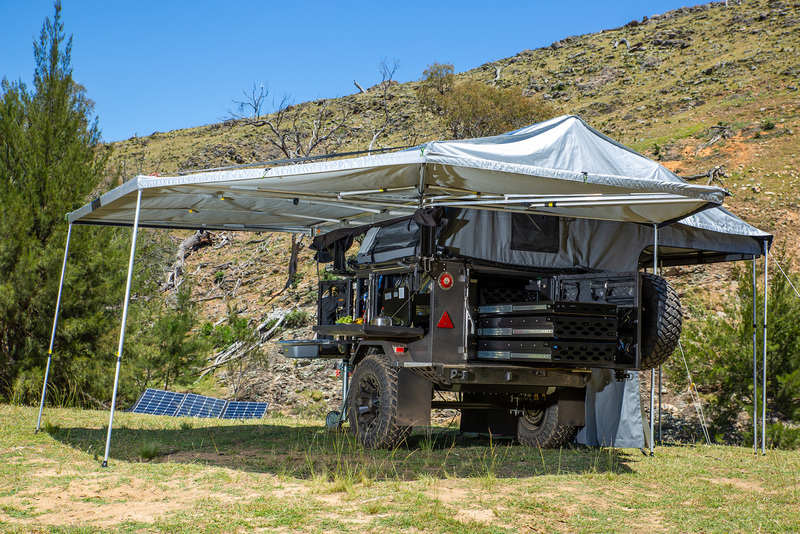 I don’t believe I’ve ever seen a more robust protection system under the body of the camper, with all of the heavy componentry (such as the twin 65 litre water tanks and dual 130A AGM batteries) housed within the main body for protection and wheel clearance. The manufacturing systems are the real winner in the presentation. 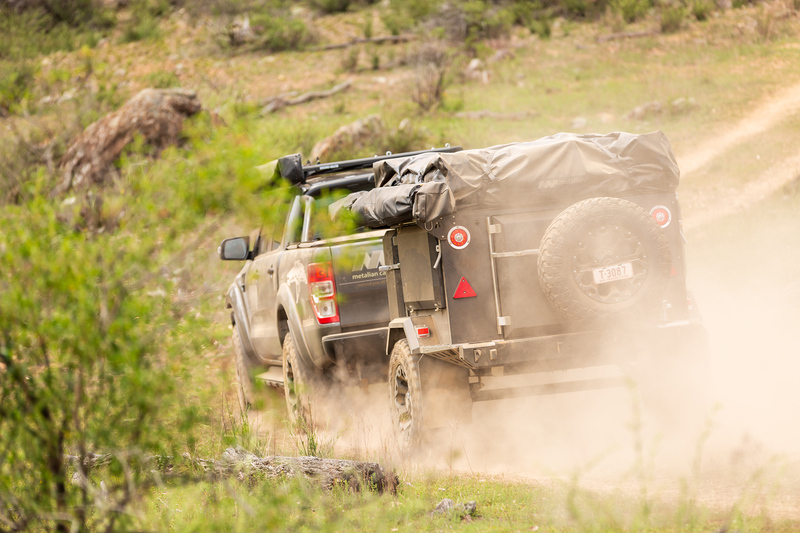 The list goes on: neatly folded, bolted, welded and gusseted joints; supremely strong foundations; powder coated finishes; excellent lightweight canvas; and the typical South African style with a place for everything and everything, with a huge array of storage pockets. Add to all of this some premium componentry, including a stainless steel National Luna fridge/freezer, HCdP MK6 lithium compatible battery management system, 200 watt solar panel with 330 watt regulator, a handy pull-out table, and huge drawers on easy slides – all in a tightly compact unit that weighs only 900kg Tare, but can carry around 600kg of load for camping comfort. The Metalian Parthian reminds me of a big, black, hi-tech transformer with the battle readiness to take on the most challenging foe. However, this capable warrior has a soft edge by providing a comfortable campsite with all of the trimmings in a most complete package. But make no mistake, this ripper little Parthian is aimed right at the heart of serious offroad fanatics.